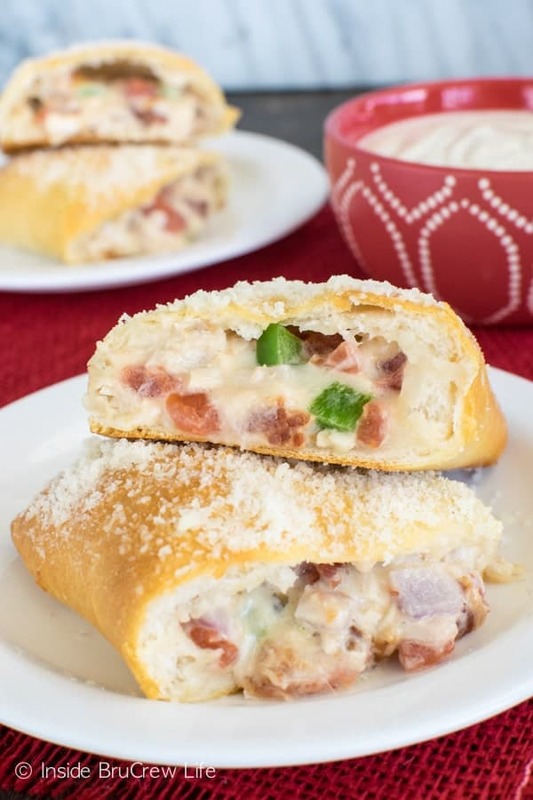 These easy Chicken Alfredo Calzones are loaded with meat, vegetables, and cheese. Little hand-held biscuits are perfect for game day or at dinner time with kids. *I am partnering with Red Gold® as a brand ambassador this spring creating recipes using tomatoes. I hear there is this big game coming up soon. Something to do with guys in tight pants running around after a little brown ball and hitting each other as hard as they can. I don’t know much about it…I just show up for the food. Just point me toward the tables loaded down with appetizers, sweet and spicy Dr. Pepper chili, and sweet treats. As long as my plate stays full of good food, I can sit and watch as much football as anyone else. Ok, fine…I’m probably sitting there scrolling through Pinterest or Facebook part of the time. My family loves pizza night. We usually have some sort of pizza every Friday night. There are a few Fridays that we change it up some, but for the most part we do the ‘za. 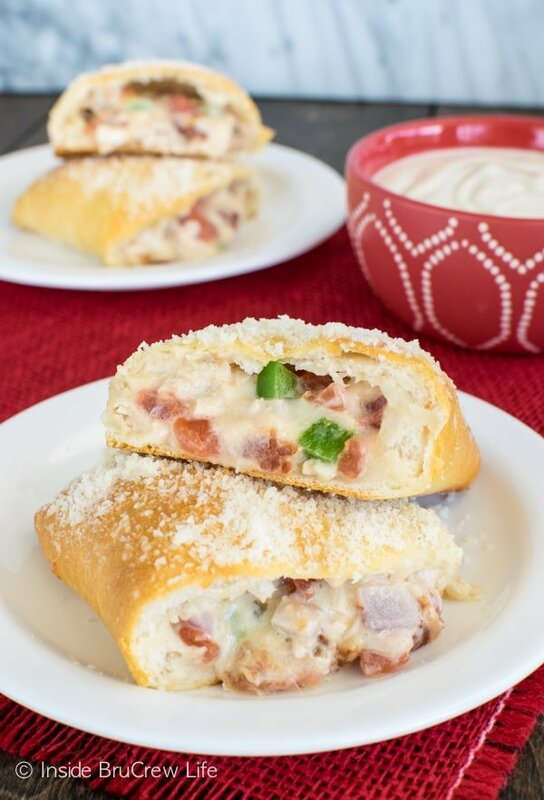 Since pizza is always a winner, I knew my kiddos and hubby would love these little hand-held Chicken Alfredo Calzones in the middle of the week. Last fall I had the awesome opportunity to visit the Red Gold® headquarters in Indiana. Since we use Red Gold tomatoes quite often in our cooking, I was really excited to learn more about the company. Seeing how the tomatoes went from the farm to the can was really fun to watch. I also learned that they are now non-GMO verified, and their cans have non-BPA/BPS liners. While we were there, they showed up how Red Gold compared to other leading tomato brands. This month Red Gold sent me a package of tomatoes to compare in my own home. The first thing I noticed when I poured both varieties into the dishes, was that Red Gold tomatoes are smooth and firm looking. Can you see the differences in the tomatoes too? My next step was to cut them in half and do a taste test. Again, Red Gold held up better to being cut with a plastic knife. I enjoyed the texture of the Red Gold tomatoes much better. It had a very good tomato flavor, without being too mushy. The other brand was a little too mushy and had a slightly strange flavor to me. Then I gently strained and washed the tomatoes to see how they would hold up. As you can see the Red Gold tomatoes kept their uniform shape, even when poured and strained with water. 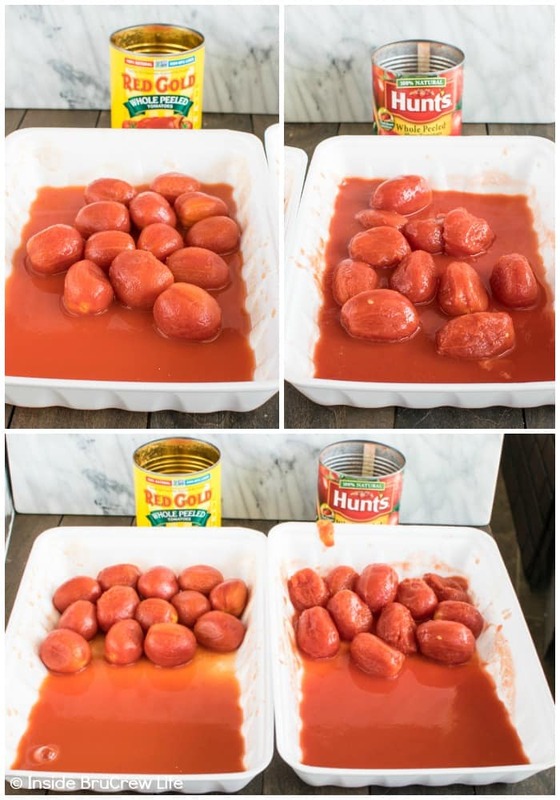 I knew I loved using these tomatoes for a reason in my kitchen. It was fun to compare them to another brand and understand a little better why I always reach for the Red Gold label first. One thing that I have been really doing a much better job at this year is having dinner on the table at 5:30. My husband changed jobs this year. Now he gets home a little later, so I had to step up my dinner game. Not to brag on myself, but most nights I have had dinner ready to go when he walks through the door. Boom! This week I had some leftover chicken that needed to be used up, so I mixed up some vegetables, sauce, and cheese and folded it into biscuits. Refrigerated biscuits are a life saver sometimes. 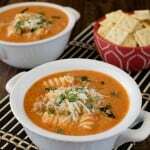 I usually have a few different ones floating around in the fridge for quick and easy meals. Flatten each biscuit out to 5 inches. Put 1/2 cup of the chicken and tomato mixture on one half of the dough. Stretch the dough over the chicken and use a fork to press the dough together. Pop them in the oven for about 14 minutes. To finish them off, brush them with a light coat of melted butter and sprinkle on some grated parmesan cheese. If you are serving these as your main meal or as game day snacks, you might want to double the recipe. 8 biscuits don’t go very far when hungry hoards attack them. 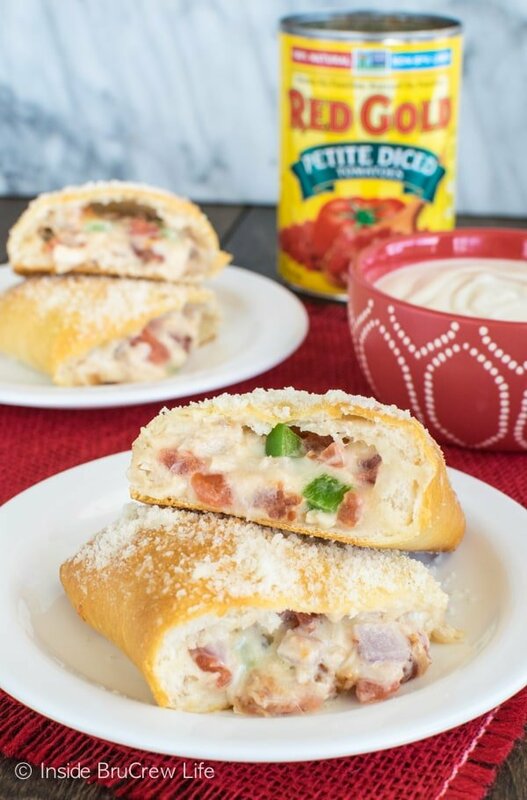 We enjoyed these chicken alfredo calzones with a pan of this pizza minestrone soup. This time I left out the pasta and used chicken instead of sausage. Your family will gobble this fun dinner down in no time! Mine sure did! 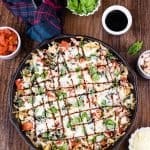 Mix together the chicken, bacon, tomatoes, green pepper, onion, garlic, cheese, and Alfredo sauce. Open the biscuits and flatten each one to 5 inches. Place about 1/2 cup of the chicken mixture on half of each biscuit. 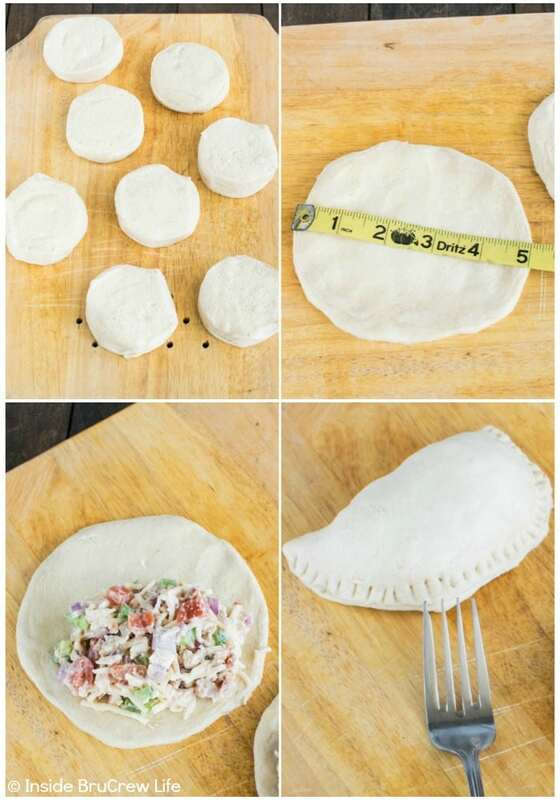 Fold the dough over the top and use a fork to firmly press the edges of the dough together. Bake at 375 degrees for 12-14 minutes. Remove and brush with melted butter. Sprinkle with grated Parmesan cheese and serve immediately. Makes 8 calzones. 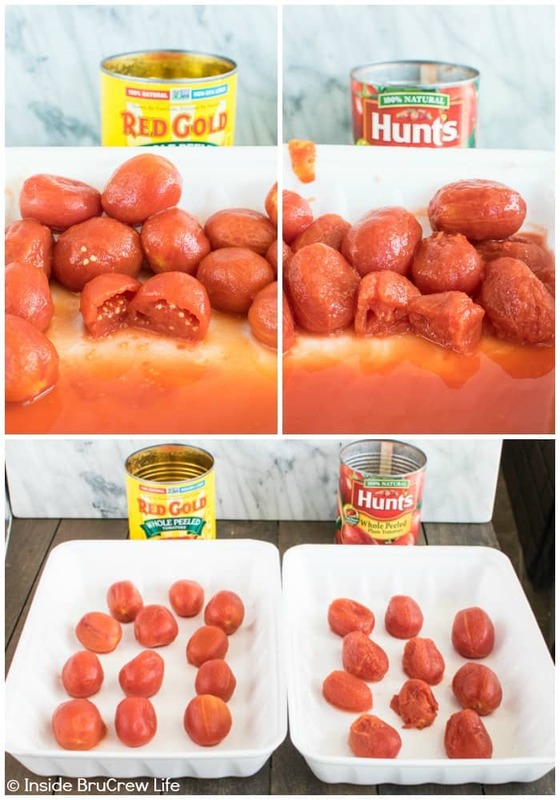 *I was compensated for my time reviewing Red Gold Tomatoes and creating this recipe as a brand ambassador. All opinions expressed in this post are 100% my own. Thank you for letting me share the brands and products we use and love. Those look delish! We have pizza on Fridays too. Can’t go wrong with Calzones! Those tomatoes look awesome. I’ll need to see if they are in my store. I don’t recognize the brand. Friday and pizza just go together like peanut butter and jelly! I hope you can find the Red Gold…I really do prefer them over any other brand. Oh yum! This sounds so good! I have not made calzones in a really long time! I hadn’t made them in quite a while either. It was a fun change up for dinner. They look incredible and it’s definitely something my whole family would enjoy. Thank you! I hope your family enjoys them as much as mine did! 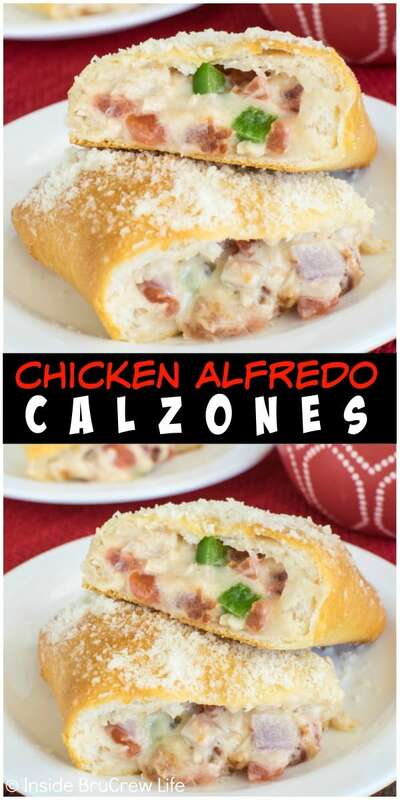 I love calzones, and usually make spinach and cheese- so this is something different! Oh, I like the sound of spinach and cheese, but I don’t think my kiddos would. Maybe I can do a partial batch next time for me. I totally agree about the tomatoes!! What a fun test with the tomatoes. I had not realized there was such a difference!! 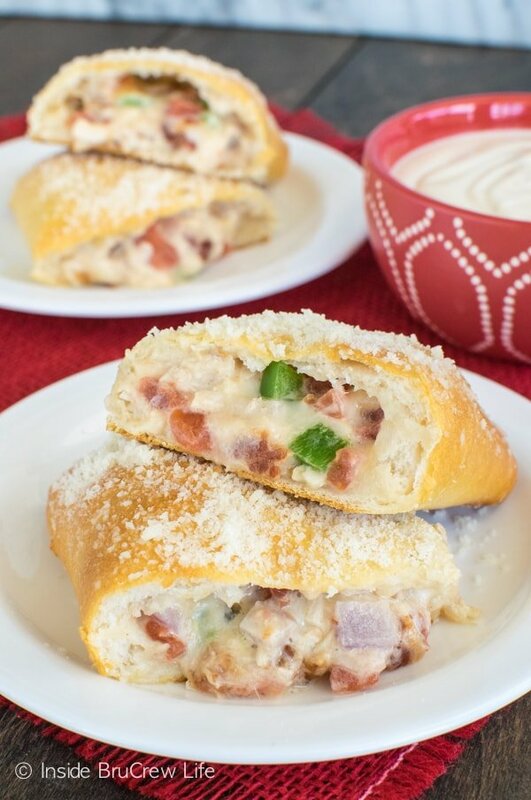 These Calzones look yummy!! It really was fun to compare them. We did it when I was at the headquarters, but I enjoyed doing it at home and seeing the same results. My family will LOVE these!!! So easy too! Yum! I like your idea of using biscuits for the crust! Those biscuits are great for quick easy meals…and so versatile too!!! We tend to use them a lot! Looks like the perfect comfort-food dinner! Yum! This really is a comfort food type meal!!! 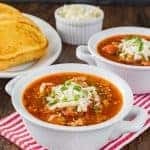 I love Calzones, I’ve never tried to make them at home though! 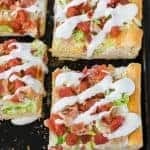 Might be a fun recipe to try out, thanks for sharing!! Using the refrigerated dough make them so much easier too! This is definitely going to be a fun one for you guys to make together! I am so sorry about that. I am working to find a fix for that problem! 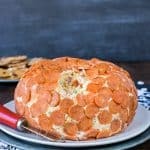 Can these be made ahead and baked then frozen for later? I’m actually not sure. We devoured them right away, so there weren’t any leftovers.